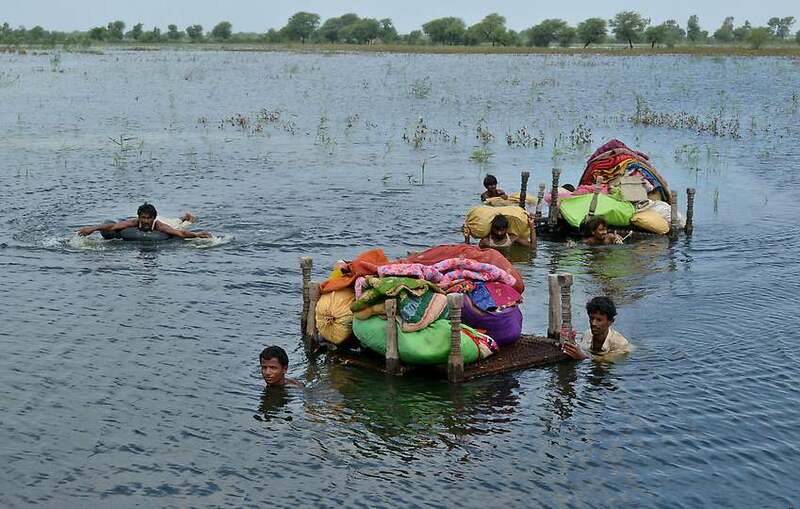 More than 5 million affected by flooding in Pakistan Sept 2011 – a repeat of 2010. This unnatural pattern is due to human heating of the climate through emissions of greenhouse gases that result from burning fossil fuels, according to the study published this week in Proceedings of the National Academy of Sciences. However, this heating of the atmosphere is wildly uneven. 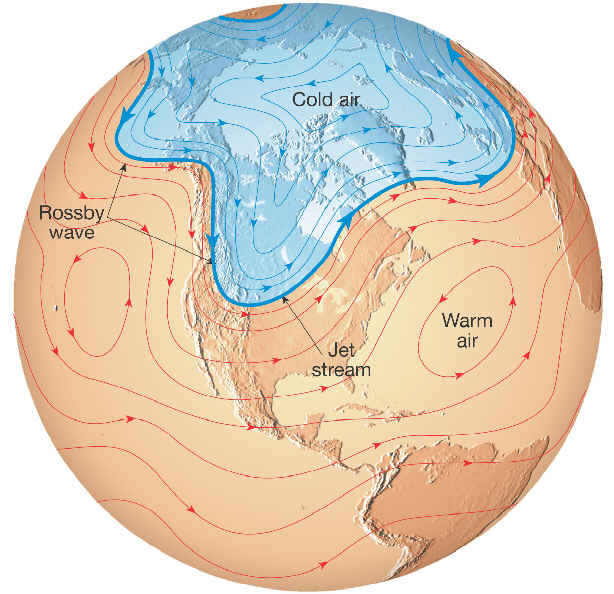 The Arctic is warming two to three times faster than the global temperature rise of 0.8C and that affects the Rossby waves and is slowing the jet stream. 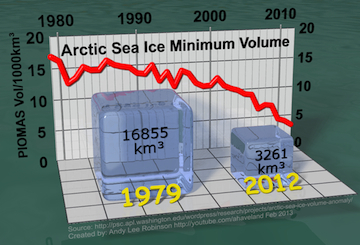 A new study released Feb 13 revealed that the volume of Arctic sea ice is declining rapidly. Ice volume in September 2012 had fallen 80 percent compared with the volume of ice in September 1980 according to the latest data from European Space Agency satellite, CryoSat-2. 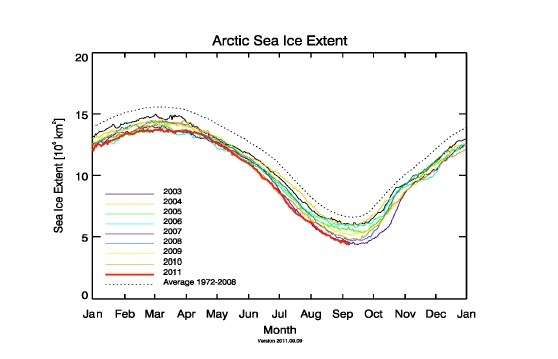 As the Arctic heats up Most of the ice loss has been in recent years. Between 2003 and 2012 the volume declined a whopping 36 percent. Summers with a sea ice-free Arctic are only a few years away, scientists now agree. This will have significant and permanent impacts on weather patterns in the Northern Hemisphere. 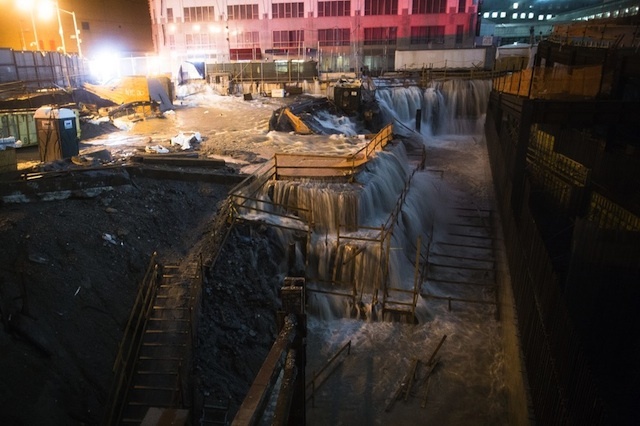 The impacts are already being felt across the entire northern hemisphere. The loss of sea ice in recent years has been affecting weather patterns, recent research has shown. The all-important jet stream – the west-to-east winds that are the boundary between the cold Arctic and the warm mid-latitudes – is slowing down, moving north and become more erratic. When continent-sized areas of the Arctic Ocean flip from the all-white ice to dark blue, tremendous amounts of heat are absorbed from the 24-hour summer sun. When the bitter cold Arctic winter sets in over the next few weeks, all the heat in the ocean must be released into the atmosphere before ice can form again. The Arctic will be ice-covered in winter for decades to come but what’s fundamentally changed is that every fall, unprecedented amounts of heat and water vapour will be released into the atmosphere. “The polar meltdown shows we’re teetering on the brink of climate change catastrophe,” said Shaye Wolf, climate science director at the Center for Biological Diversity’s Climate Law Institute. As the sea ice declines, Arctic temperatures increase, thawing more and more permafrost, which will release more climate-heating carbon and methane. Permafrost is frozen soil, sediment and rock spanning 13 million square kilometres of the land in Alaska, Canada, Siberia and parts of Europe. 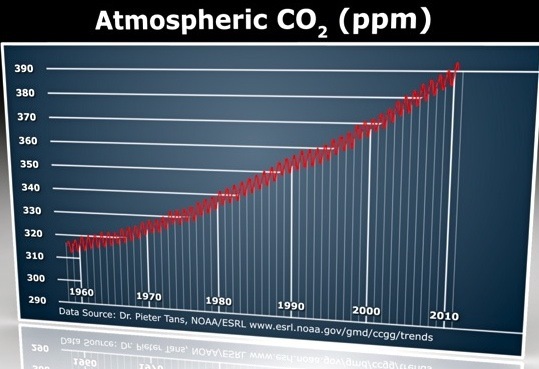 It has twice the carbon that the atmosphere currently holds. A Swedish study released Feb 17 has found a link between sea ice declines and increases in methane emissions. Methane has 40x the warming of carbon. This is may lead to an even faster meltdown of the Arctic risking the release of huge amounts of permafrost carbon and methane. Activists are calling Keystone “the line in the sand” regarding dangerous climate change, prompting the Sierra Club to suspend its 120-year ban on civil disobedience. The group’s executive director, Michael Brune, was arrested in front of the White House during a small protest against Keystone on Wednesday. “The Keystone XL pipeline is part of the carbon infrastructure that will take us to dangerous levels of climate change,” said Simon Donner, a climate scientist at the University of British Columbia. To permit the pipeline would represent a heartbreaking acquiescence to climate change on the part of President Obama and our national leaders. “By itself, Keystone won’t have much of an impact on the climate, but it is not happening on its own,” Donner told IPS. Carbon emissions are increasing elsewhere, and the International Energy Agency recently warned humanity is on a dangerous path to four degrees C of warming before the end of this century. Children born today will experience this. Preventing that dire future is inconsistent with expanding tar sands production, Donner said. A new study released this week revealed that the volume of Arctic sea ice is declining rapidly. Ice volume has fallen 80 percent since 1980, according to the latest data from European Space Agency satellite, CryoSat-2. Summers with a sea ice-free Arctic are only a few years away, scientists now agree. This will have significant and permanent impacts on weather patterns in the Northern Hemisphere. “Keystone XL is the key to opening up the expansion of the tar sands industry,” said Jim Murphy, senior counsel with the National Wildlife Federation. “By rejecting the Keystone XL tar sands pipeline, we can keep this toxic oil in the ground,” Murphy said in a statement. The melt of Arctic sea ice has reached its lowest point this year, shrinking 18 percent from last year’s near-record low. Summer ice this year is half what it was 30 years ago and is now affecting weather patterns. 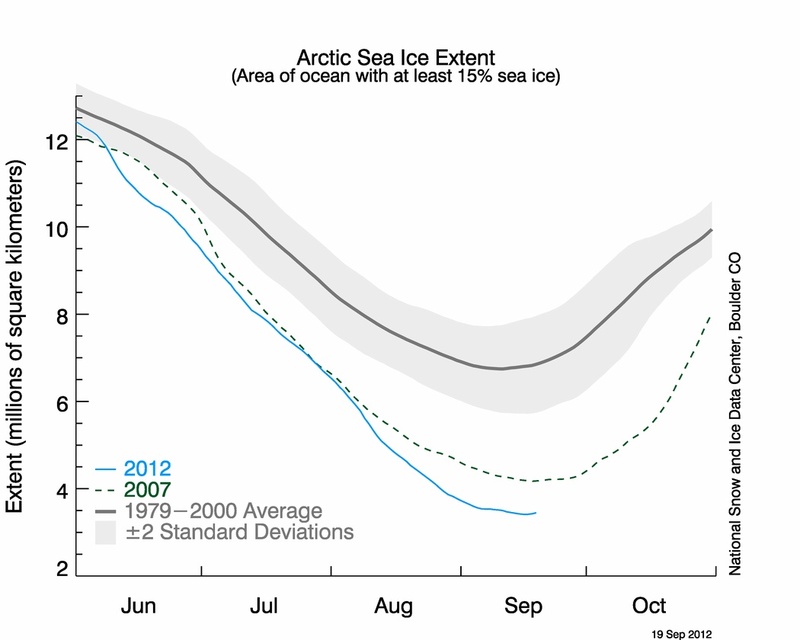 The massive declines in ice in recent summers have shocked scientists and Arctic experts. Some predict that in just a few years we will witness an event that hasn’t happened in millions of years: the complete loss of summer ice. “We are now in uncharted territory,” said Mark Serreze, director of the National Snow and Ice Data Center (NSIDC) in Colorado. “Few of us were prepared for how rapidly the changes would actually occur” as a result of the burning fossil fuels that are warming the planet, said Serreze. “We could see an essentially ice-free Arctic ocean in late summer by the year 2030,” he told IPS. Not long ago experts thought the soonest the Arctic would be ice-free was 2070. Now it’s anywhere from four to 18 years away. 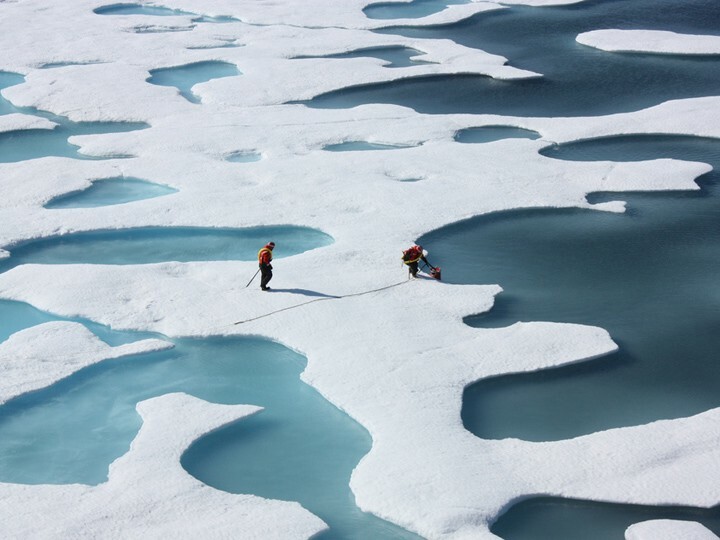 “Europe, eastern Asia and eastern North America is connected to unique physical processes in the Arctic,” said James Overland of the NOAA/Pacific Marine Environmental Laboratory in the United States. “In future, cold and snowy winters will be the rule rather than the exception” in these regions, Overland told IPS in Oslo in 2010. The summer’s record loss of Arctic sea ice may mean a cold winter for the UK and northern Europe, Jennifer Francis, a researcher at Rutgers University, told the Guardian last week. All the analysis and commentary about safety and security on the tenth anniversary of 9/11 ignored by far the biggest ongoing threat to global security: climate change. Just days before Sunday’s commemoration of the attacks, German scientists pointed to yet another smoking gun of climate change: the Arctic sea ice reached a new historic minimum ice extent. The rapidity with which the planet is losing its northern ice cap continues to astonish experts. The defrosting northern pole is one of the prime drivers of Earth’s climate system and is changing global weather patterns in unpredictable ways. The Arctic ice melt is also accelerating the rate of climate change beyond what humanity is doing with every barrel of oil, tonne of coal or cubic metre of gas burned. On Sep. 8, researchers at the University of Bremen in Germany reported that the Arctic ice melt bettered the previous minimum of 2007. Other research centres using different satellite and analysis tools say the extraordinary decline of ice in 2007 has not yet been exceeded this year and 2011 remains a close second. “We think it will end up a little bit short of the record – not that it really matters,” said Mark Serreze, director of the National Snow and Ice Data Center in the U.S. city of Boulder, Colorado. “What is extraordinary this year is that there was no weird weather pattern that created the perfect conditions for the record melt in 2007,” Serreze told IPS. This year, the summer weather was normal and yet it the ice vanished in similar amounts to 2007. “That tells us the sea ice is too thin now to hold up under normal weather conditions,” he said.